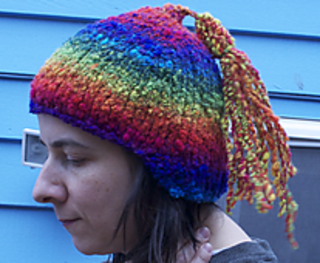 This hat is knit from the top down because I wanted the colors to flow seamlessly to take advantage of the rainbow striping pattern of the yarn. Using boucle yarn also helped with the seemless effect, because you can’t easily tell that I switched from stockinette to ribbing at the flap. The back flap helps keep the ears and back of the head warm. It reminds me a little of a helmet, and is named after the nickname of Rainbow Dash (from My Little Pony: Friendship is Magic).